Send scream-worthy greetings this October with our Spooky Apothecary Pop-Up Halloween Card. 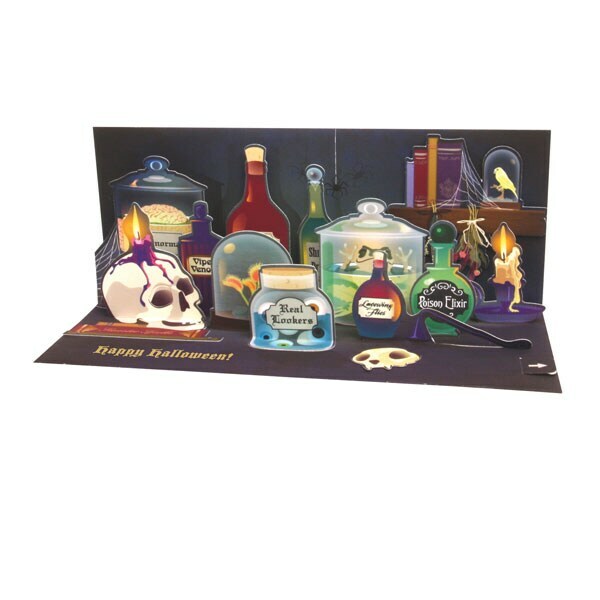 This eye-catching 9¼"x3¾" card features a pop-up panorama of witchy bottles, jars of questionable contents, and stacks of books—and for that extra-special touch, simply pull the tab to hear the first few bars of Bach's "Toccata and Fugue in D Minor" to get you in that Halloween spirit! The back of the card is blank for you to add your own spells, incantations, or well-wishes. The best part: It can be displayed on a desk or mantel, or beside your favorite cauldron as a spook-tacular decoration. Matching envelope included; extra postage required.